Synopsis: In 2010, a documentary team was assembled to investigate the legend of the Clophill witches and to try and uncover the truth behind the paranormal events. What followed during that long weekend at Clophill was a terrifying journey into the unknown. My Quick Review: Clophill is a UK entry to the Fake documentary genre and, despite some lengthy exposure, it does the job. 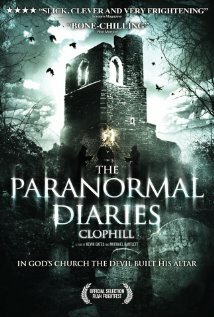 While watching Clophill you feel like you’re watching one of those Ghost chasers show, and this is actually not as bad as it sounds. The documentary crew seem genuine enough and the location is an actual infamous haunted ground. If you’re into paranormal stories based on real places/events, you should be able to enjoy Clophill and get yourself immersed in the story. And this is probably the only way you will be able to feel some jolts towards the end when there is a cresecendo in the ghostly happenings. It’s a pity that the filmakers (who are behind the Zombie Diaries movies) felt they had to add some family scenes (in the beginning and at the end) to give the movie more meat and bring even more scares towards the end. Those scenes are the weakest and fell very staged. The documentary part works as a creepy investigation of the paranormal and will satisfy a niche audience. For most horror fans though, the lack of scares or genuine horror will have them turn off their tv way before the movie ends.